A nearly full-length portrait of a youth wearing a light coloured body cloth and textile tied around his head. Based on the film number it seems that the location is probably in the vicinity of Nasir, which Evans-Pritchard revisited during his short period of fieldwork in 1935. 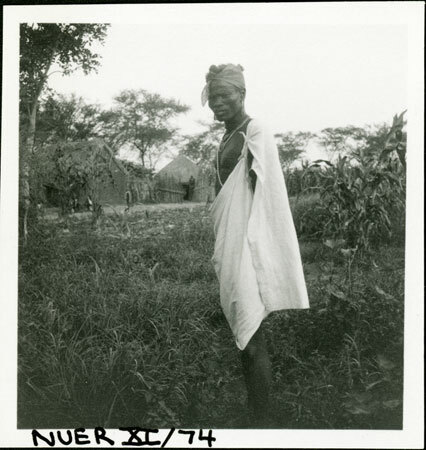 This might explain the man's clothing, since textile wraps were usually worn by the Nuer in colonial and larger settlements. Note on print reverse ms pencil - "28 A202" & print front border ms ink - "NUER XI/74"
Morton, Chris. "Portrait of a Nuer youth" Southern Sudan Project (in development). 03 Jan. 2006. Pitt Rivers Museum. <http://southernsudan.prm.ox.ac.uk/details/1998.355.534.2/>.